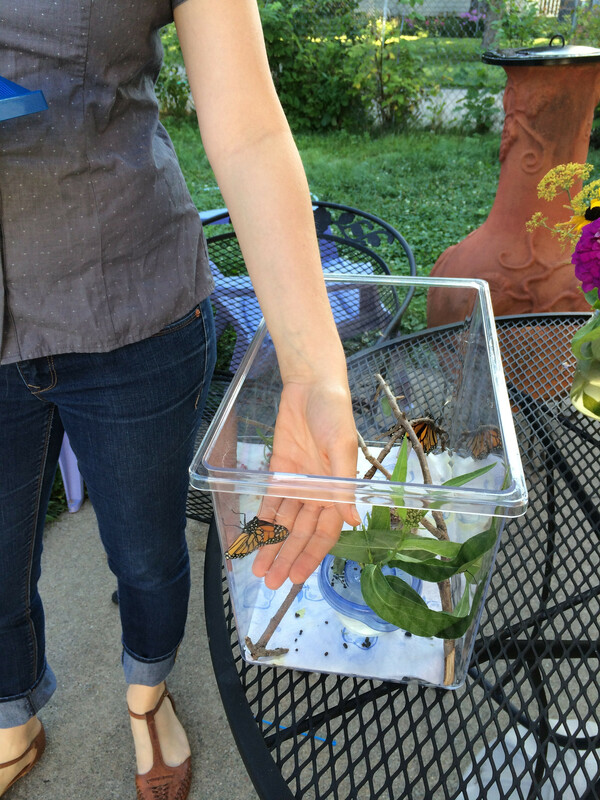 Raising butterflies this summer has been a pretty exciting experience! The few I just released will mate and lay eggs to hatch the next generation. This next generation is the group that will make the trek down to Mexico for the winter. This phenomenon is the biggest organized annual insect migration in the world. It’s beautiful! Monarchs congregating in Mexico. Image from the Wikipedia article on the Monarch Butterfly Biosphere Reserve. Raising these little ones has been pretty easy. 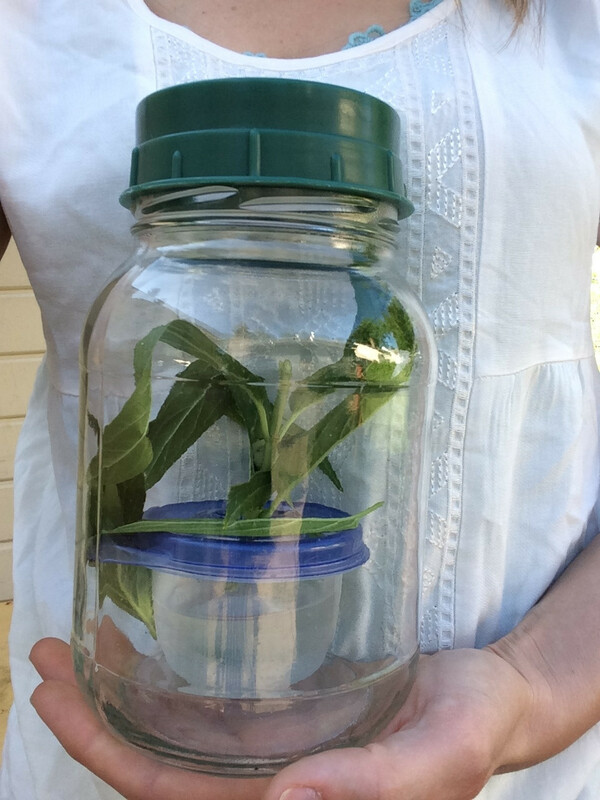 Here’s a quick HOW TO guide to rearing some monarchs at home. I highly encourage you to read a couple more instructions on this topic from other authors so that you have a good idea of several things that work, as well as troubleshooting methods. Have a clean jar or tupperware ready for tiny caterpillars. Any holes need to be extremely small since the caterpillars are smaller than a grain of rice when they’re new. The egg, and the first few stages of the caterpillar don’t need much space; a butter tub, jelly jar, or tiny tupperware will be fine. Any air holes are to prevent condensation in your container so your leaves and eggs won’t rot. Search milkweed patches for eggs. Look at the bottom of the leaves for small white eggs (they’re actually egg shaped) and collect the whole leaf. Give that leaf a little moist paper towel wrap around the end of the stem with some tin foil over that. The wet towel keeps the leaf hydrated, and the foil keeps the paper towel from drying out too fast. Check your milkweed leaf daily to see if the tiny egg hatched. Eggs hatch in 3-5 days. Notice that the whole egg is gone, and that there is a teeny caterpillar that is eating around the area her egg was. There will be some green/black crumbs built up on the leaf too, that’s poop. These caterpillars will eat their own egg shell to recycle the nutrients, and get to work on the leaf right away. If eggs are kept too close, a caterpillar may even eat their unhatched siblings. I usually had one or two leaves in a small tupperware on opposite sides. 2 different caterpillars. The big one on the left is probably only a day or two older than the one on the right. Clean out the poop (called frass) and give them a fresh leaf every day. 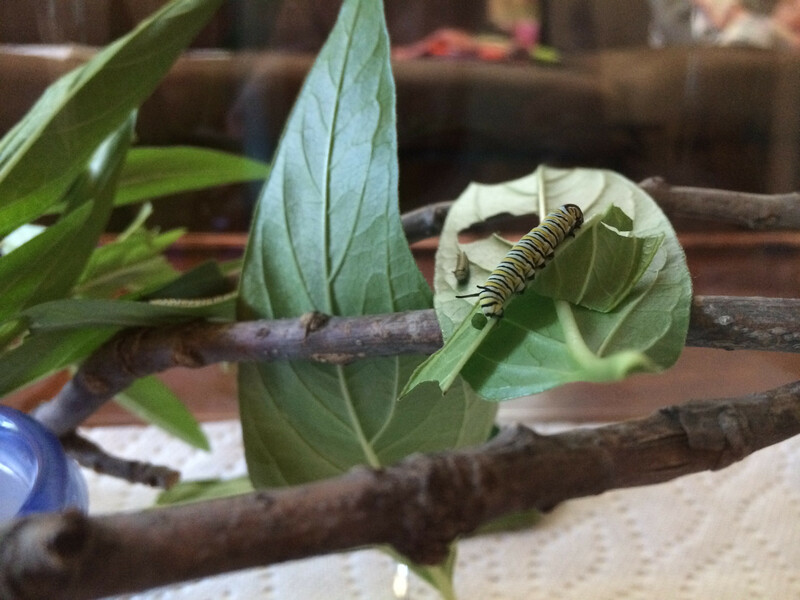 The caterpillars are babies for only 2 weeks, so now is no time to take a vacation! They need daily attention. Toss old leaves if they get dry, or moldy. The babies will eat and grow pretty fast. They’ll turn those leaves into poop faster than you would guess, so make sure you have some more leaves on hand. Pro Tip: Wash all your fresh milkweed leaves and branches off and pat them dry before feeding them to the babies. This makes sure you don’t accidentally put in other bugs that would eat your babies while you’re at work. Once the caterpillar is big enough, you can move it to a larger container. 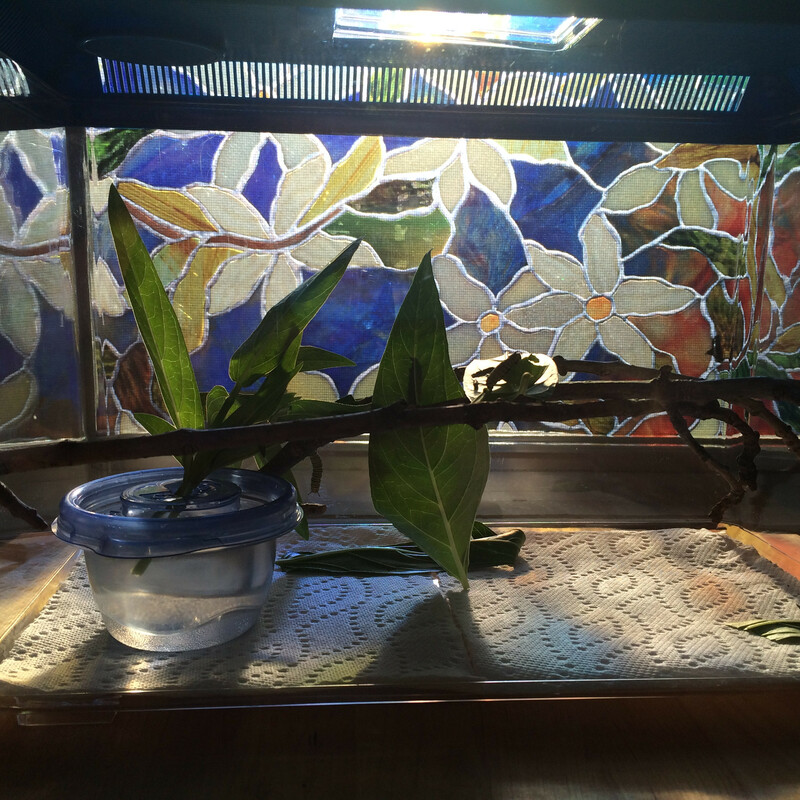 You need something that has enough room for lots of leaves, sticks, and lots of ventilation. I have a critter keeper I got at a pet store for $12, but an old aquarium or huge pickle jar would work great too. This container needs to be big enough for an adult butterfly to move around and open it’s wings fully later on. Continue to clean out poop and supply fresh milkweed every day. Caterpillars are frassholes. If you don’t keep fresh leaves available, the caterpillars will cannibalize and eat each other (this is a survival game to them, after all). A dry paper towel on the bottom of your cage will make your life easier. I liked to use fun patterned napkins to make the whole cage cuter, but everything will be covered in poo any how. Once the caterpillars are an inch long, they will eat and poop faster than you can believe! Keep up with them and remember, you’re almost done. A constant supply of fresh milkweed is key. I used a small tupperware with an X cut in the top to shove stems of milkweed into, the way a pop lid holds a straw. This keeps your caterpillars from drowning, and your milkweed alive while it gets eaten. 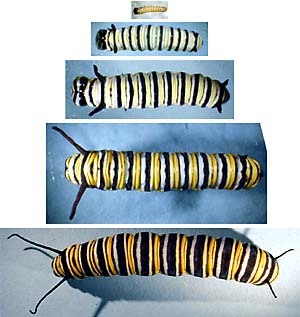 The 5 instars of the monarch caterpillar. Image from MonarchWatch.org. Watch your caterpillars, don’t try to hold them. Your caterpillars will go through 5 stages of growth and they actually shed their skin 5 times as they grow, but they eat the skin right away after shedding it. Gotta recycle those nutrients, don’t cha know! If your caterpillar is just sitting there straight without moving on a leaf or stick, whatever, leave it alone. Caterpillars attach their feet to something to help them shed their skin. Messing with them could be the end of them. Keep the cage safe. Place it out of direct sunlight in and away from your pets and children who like to smash things while you aren’t looking. The caterpillars get fatter every day until they are ready to change. Once the caterpillars are pinky finger size, they’re about ready to make a chrysalis (butterflies don’t make a cocoon, they make a hard shelled chrysalis). The caterpillar will climb to the nearest stick or to the cage lid, and attach itself with little silky sticky fibers. If you see the caterpillar hanging in a J shape, you know it’s about to get crazy in there! 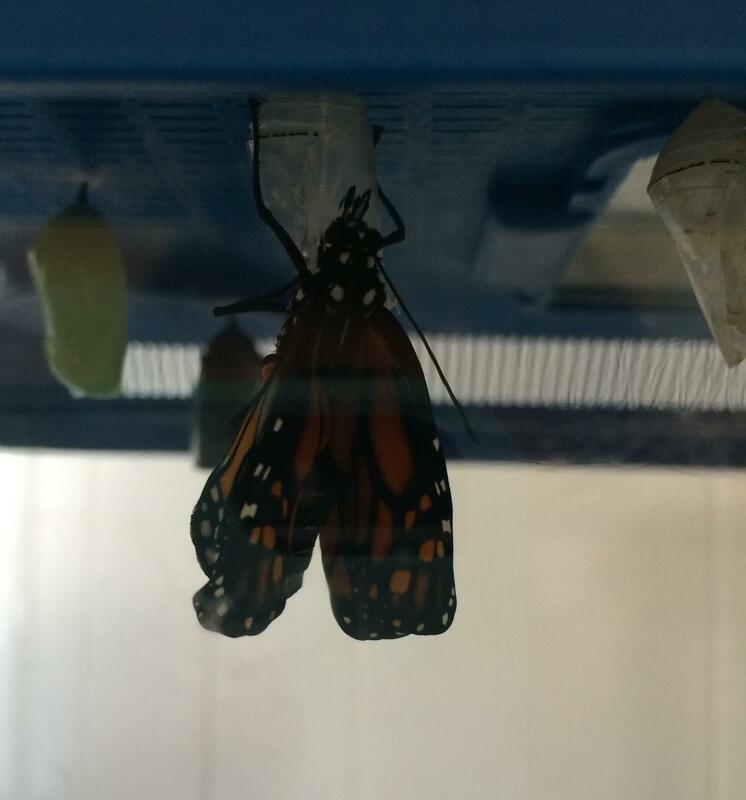 The monarch sheds its skin once more to reveal a green chrysalis. You might see the skin or head of the old caterpillar stage on the bottom of your cage. Monarch chrysalis’ are beautiful! Also, at this stage they don’t poop any more! They only need to be left alone to do their thing. 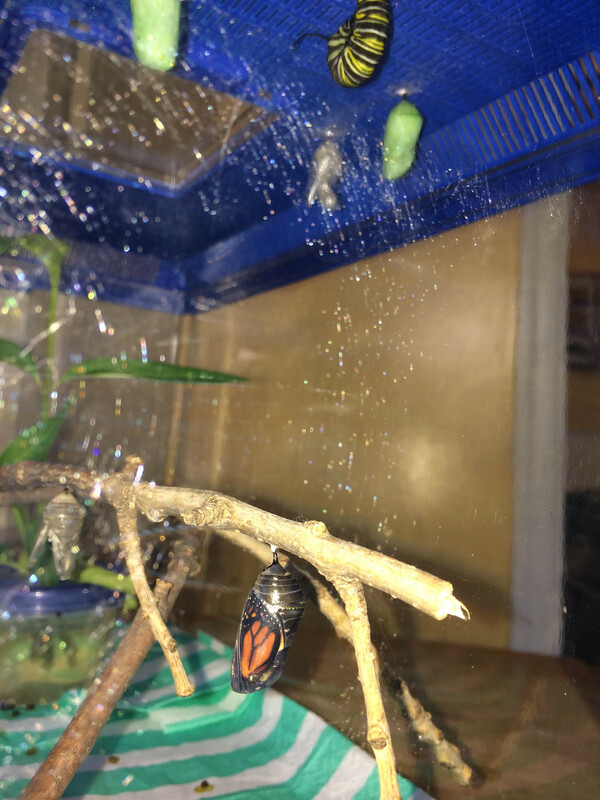 The chrysalis starts out green and about 2 weeks later will turn transparent so you can see the orange and black wings inside. Freshly hatched with crumpled wet wings. Once your chrysalis turns dark, or orange, It’s about to hatch. Monarchs hatch around mid morning. They come out all squashed up and wet. Don’t touch them. Let them hang out and pump their wings up to full size. Once their wings are inflated, they still need to dry out for a few hours. 2-3 hours after hatching, they’ll be ready to fly. Take them outside and let them go! The adults can survive for about 24 hours without nectar from flowers, so it’s ok to wait till the next morning to release them. Don’t go over 24 hours or they’ll starve. My monarchs hatched while I was at work, so when I came home I let them fly. If the weather is bad, or you get home pretty late, you can wait until the next morning. They’ll be hungry so releasing them near flowers is a good idea. You can gently grab the butterfly by the wings when all 4 wings are closed together. Gently pinch the wings while they’re closed and place your butterfly on a nearby flower or branch, or on you if you’re not nervous. Butterflies don’t have teeth, they just have a straw mouth for nectar. They can’t hurt you. Their feet have little grippers but they don’t hurt at all either. BE GENTLE! Hold all four wings shut. This is a release from 8/16/14 with one male and one female. See how the females have thick black lines in their wings and the males have thin lines? Also check out the two black fat dots in the male’s hind wings. This image is from MonarchWatch.org. You can tell the gender by the wing markings. Females have a thick, stained glass style wing pattern with more intense colors. Males have thin lines and two tell tale black dots on the hind wings within the black border line. So far this year, I’ve released 4 females and 3 males. 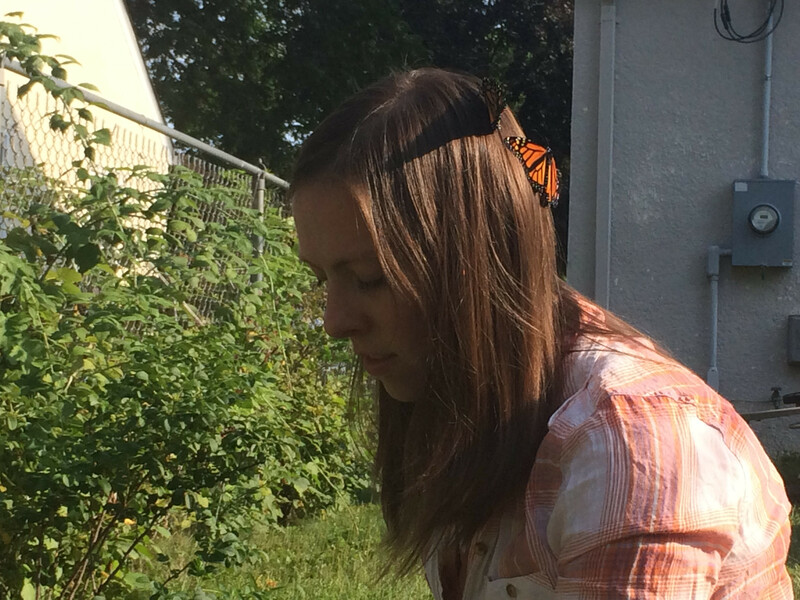 Here is a very good picture of the wings on MonarchWatch.org. 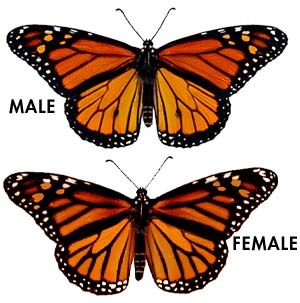 That site has a lot of info on monarch life cycles and biology as well. The monarch population needs all the help it can get to recover from deforestation in Mexico, and milkweed loss all over the USA. We’ve lost 90% of the population we had two decades ago, most loss happening in the past three years. 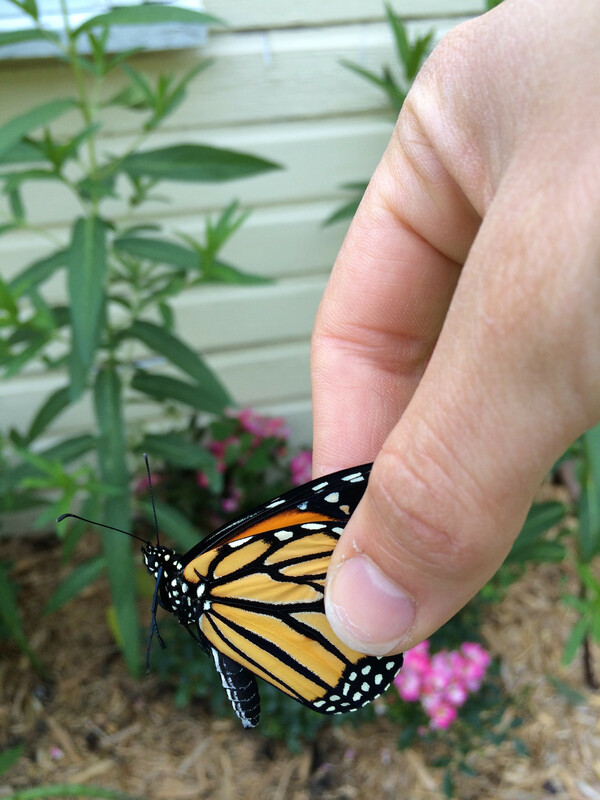 Raising monarchs inside increases their chances of survival from about 1 out of 5 to about 9 out of 10. Plant milkweed in your yard. It will come back every year and feed monarch caterpillars all summer long. This is the only plant the babies eat, and the only plant the adults will lay eggs on. Plant some native and butterfly attracting flowers to feed the adult monarchs. Please remember to plant some very late bloomers like asters and mums to feed that last generation of monarchs to fatten up the adult butterflies who will make the journey to Mexico over the winter. Avoid using pesticides in your yard, especially on the plants you want butterflies to visit. This includes buying and planting flowers that are treated with pesticides at the greenhouse/factory that the plants were started at. Check the tags and ask the vendor if they have pesticides in their soil for seedlings, or spray their plants with pesticides. Learn about butterflies and talk about them with friends. I got turned on to raising them by a friend who posted her sister-in-law’s butterflies on Facebook. I started posting my own pictures and talking about them at work, and now a co-worker is raising a few with her sons. Even if you don’t want to raise your own at home, you can talk about them and spread the word and pictures. You might inspire someone to plant some milkweed, or raise some to help the population! It all helps. And, for the truly dedicated: Free milkweed seeds given out here!